Every weekend, thousands of millennials are faced with making an incredibly important decision. It really is one of the biggest questions of our generation. Where should we go for brunch? It can be really overwhelming, and the pressure on the one picking a restaurant is massive. You don’t want to disappoint, because then you’ll be known as the one who picked a crappy brunch place that doesn’t Instagram well. Because then all the trust your friends had in you is gone. So I did the leg work for you. 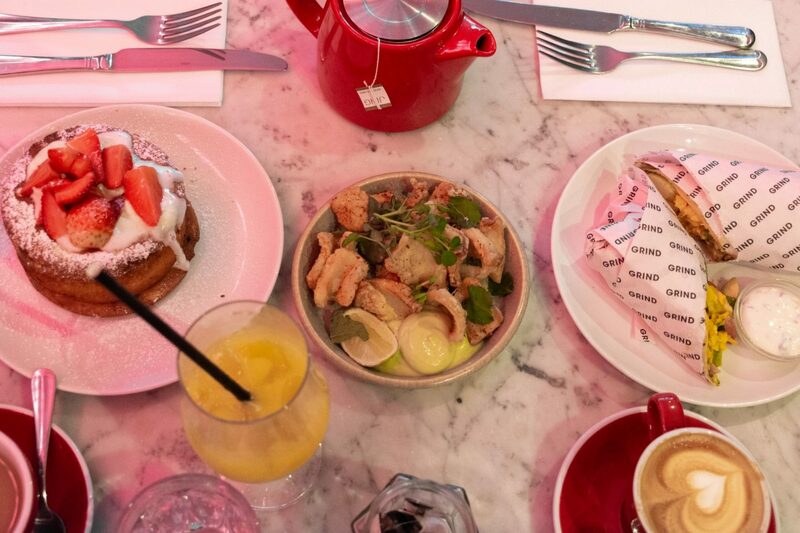 I found six of the best brunch spots in London, which will be a hit with you and all your friends, so add them all to your list! 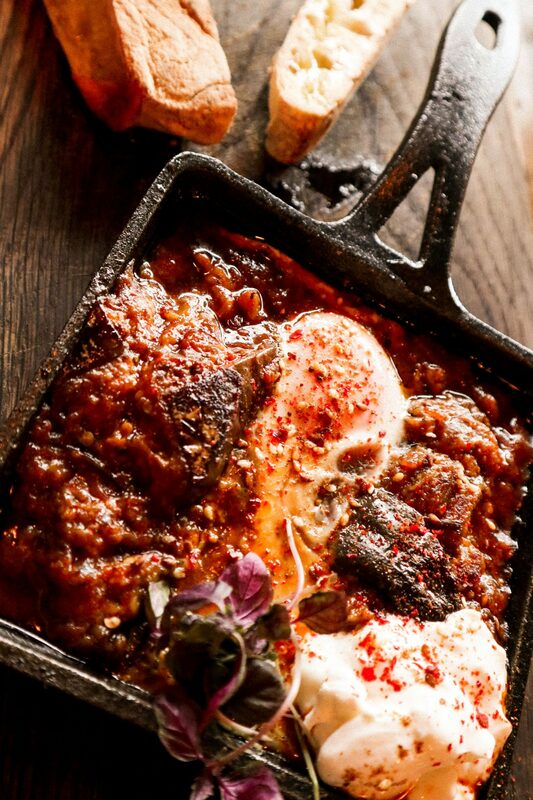 Here are six of the best brunch spots in London, tried and tasted! A Grind is a Grind, and we all love it. 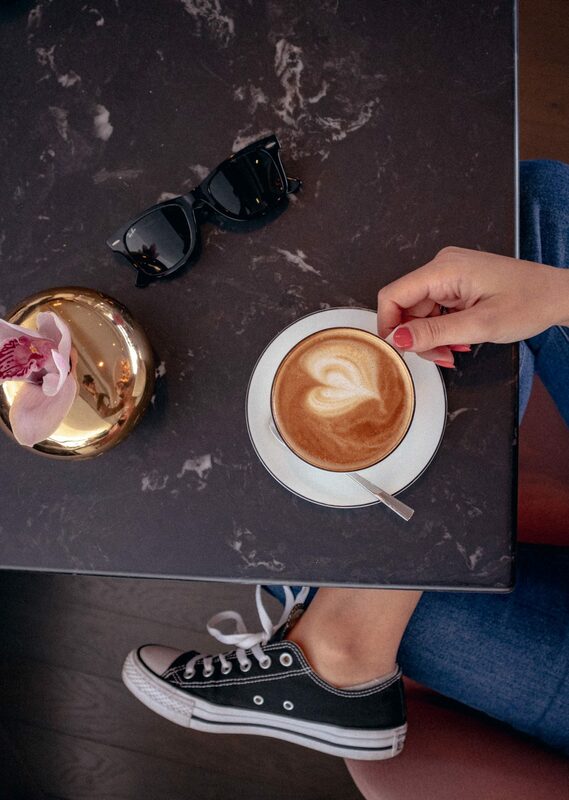 Be it for brunch, coffee or cocktails, you can’t go wrong. 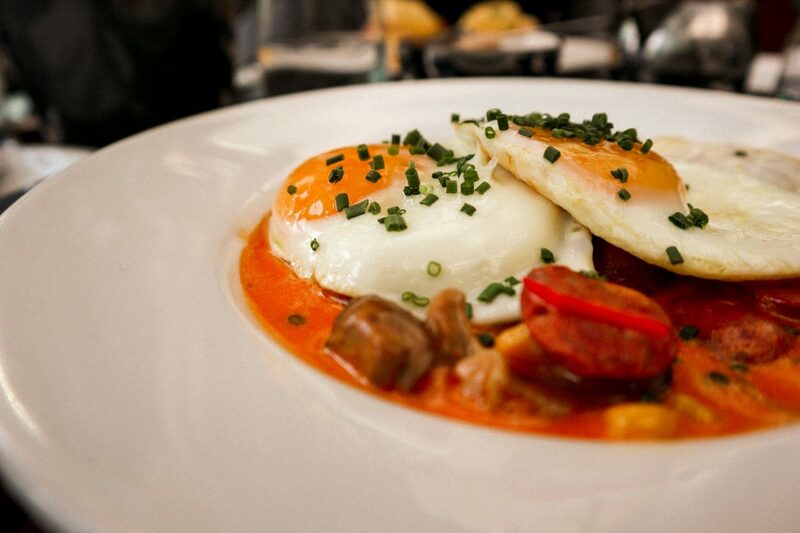 The Exmouth Market one is a popular one and tends to get busy, so I’d suggest booking a table in advance. 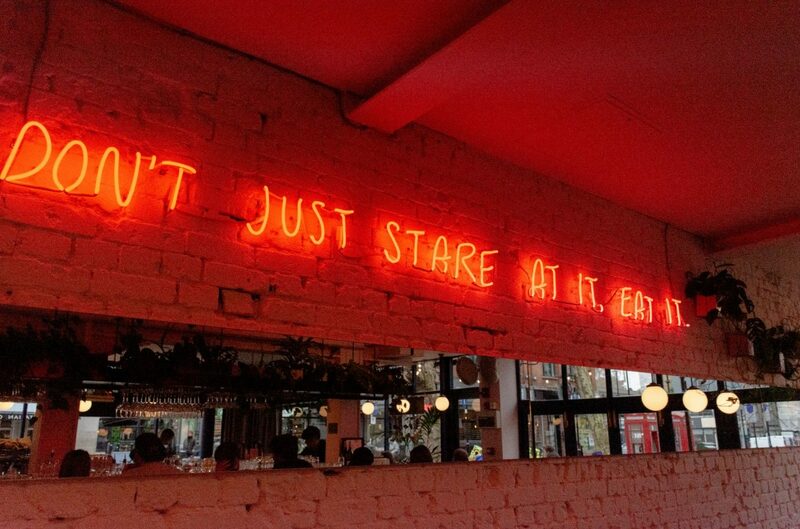 Other than that, it’s business as usual – white tiled walls, plants, pink menus and a neon sign on the wall. We waited a bit to get served and get our food (or maybe it seemed like forever because we were starving) but it was totally worth it. I had the buttermilk pancakes, which came with fresh strawberries and coconut cream and Simon had the breakfast burrito, which were both SO yum! I was greedy and also ordered some crispy squid, which was completely unnecessary but also very tasty. To say we were full after this would be an understatement. 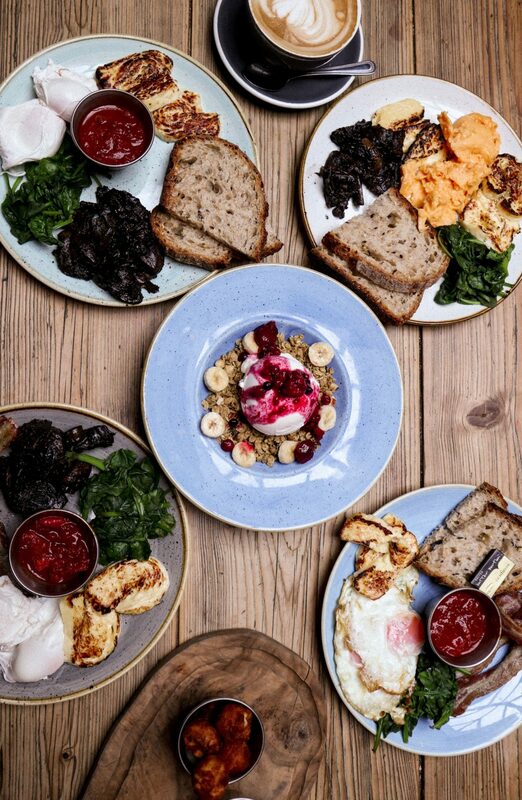 If you want to have a yummy breakfast and snap a couple of Instagram pictures, Exmouth Market Grind is your place. Ok, this is only local if you live in SW London, but if you don’t, it’s actually worth the trip to Stretham. I would suggest getting there early-ish, because you can’t book, and the place -is quite small. We got there around 10.30am I think and got to pick our table, so early brunch is a good idea. The service is lovely and quick, which is always appreciated when you’re a hungry bunny. Simon and I very rarely order the same thing, but this time we both went for the Baked egg in aubergine imam, and it was divine. I am obsessed with aubergines at the moment, and Simon’s favourite food is eggs, so this hit the jackpot straight away. It came with two slices of bread, but honestly, it was very yum, so I could have had more. 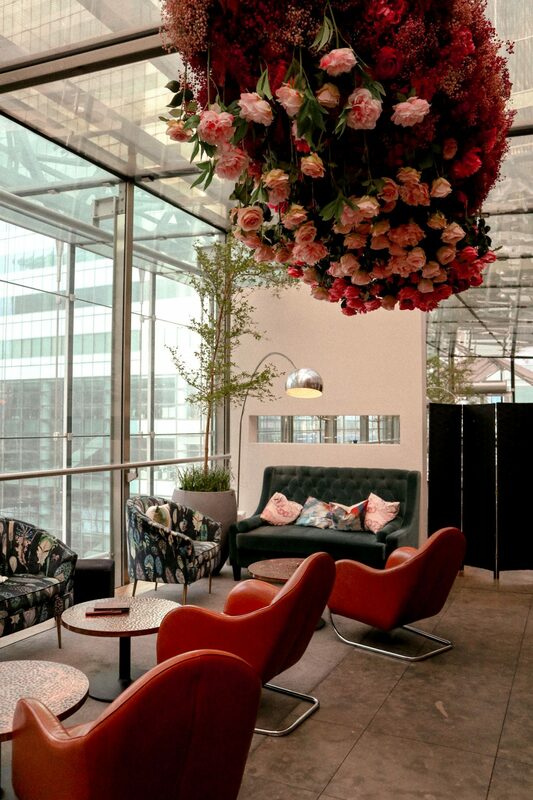 Have you ever been to Canary Wharf of the weekend? If not, Plateau is the perfect reason to head there. It’s nice and quiet, as most of the bankers who work there have vanished for the weekend, and there aren’t many residential buildings in the main bit, so it’s like a quiet mini New York. It’s wonderful for a post-brunch stroll! If you can, get a table by the window, as you’ll have a lovely view of the empty office buildings and streets of Canada Square, which gives me a bit of a New York feel. Food-wise, OH MY GOD! 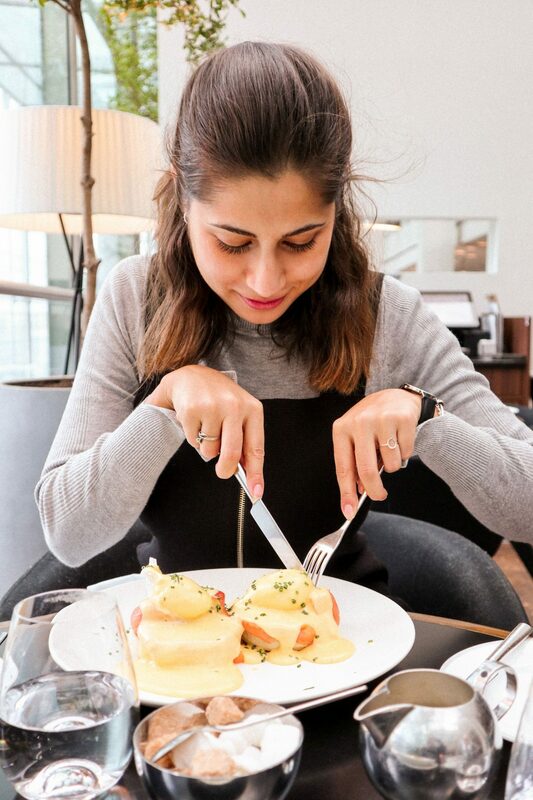 I had the Eggs Royale (poached eggs and smoked salmon on muffins, drowned in Hollandaise) which were a delight, and Simon had fried eggs with chorizo, sweetcorn, mushrooms and spring onions. SO yum! And we also had dessert, because that’s what you do in boujee places. 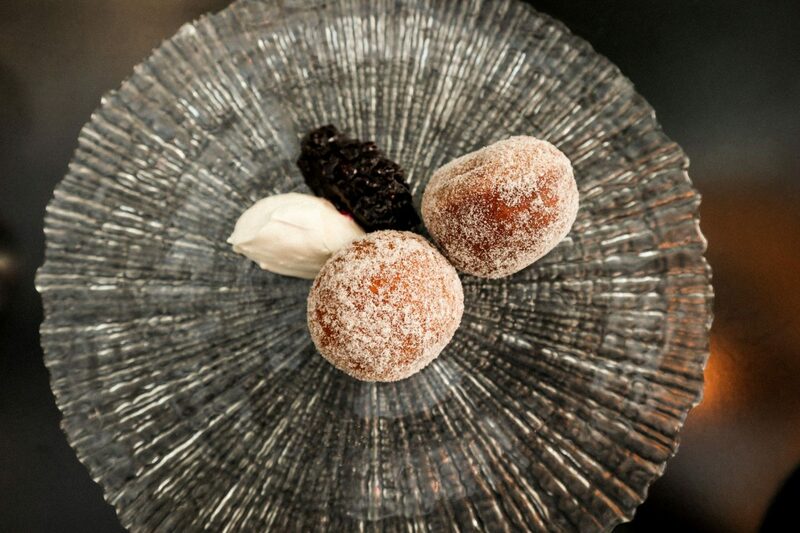 Homemade cinnamon doughnuts? Count me in! 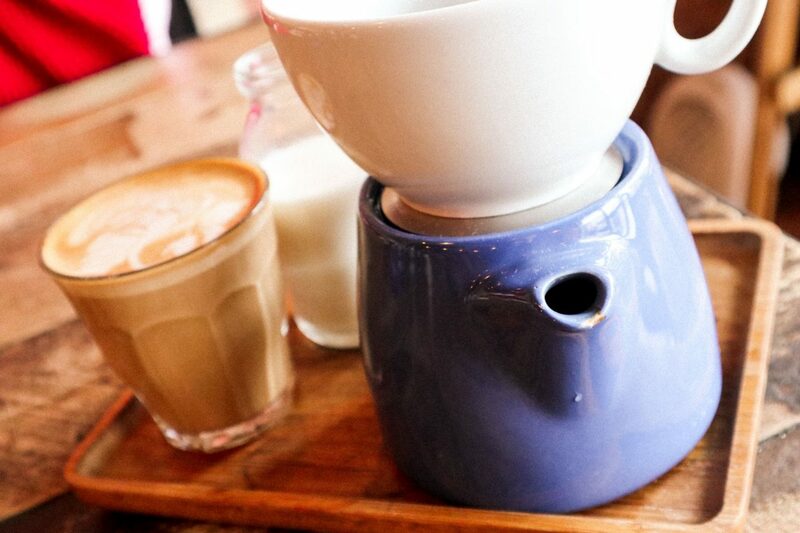 It’s conveniently located a few steps from Tottenham Court Road station, so super easy to get to. And it’s super cute! The decor is to die for, and I am obsessed with the pink chairs in the main dining area. It kind of reminds me of Mad Men a little bit, and I love Mad Men. We had an early brunch, at which point the place wasn’t busy at all, so our food came super quick. I went for the waffles with bacon and maple syrup, which were very yum, and Simon had the Gruyere and ham omelette because we can never say no to Gruyere. It came with chips on the side, instantly making it the best omelette ever! 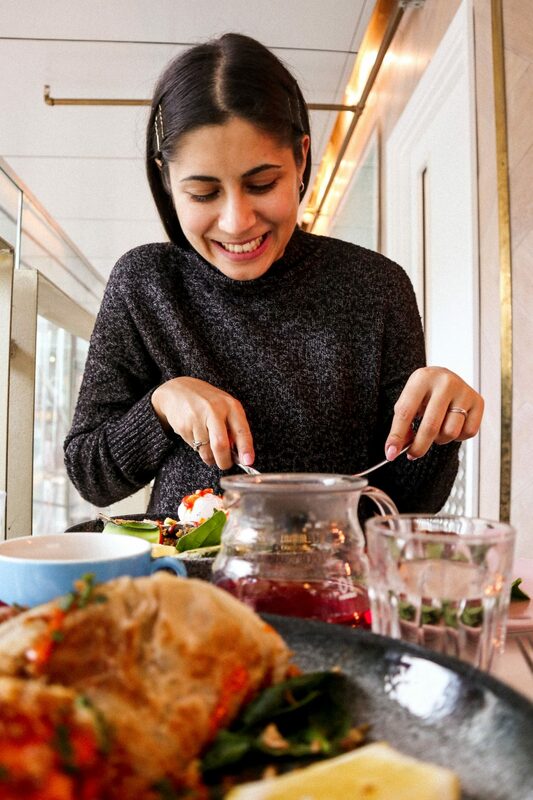 Side note – Vivi is also fab for after work drinks! Victoria has become one of my favourite areas in London to hang out with friends, not only because it takes me less than half an hour to get there, but also because of all the new bars and restaurants popping up all around. Friday night drinks? Victoria. Fancy dinner date? Victoria. 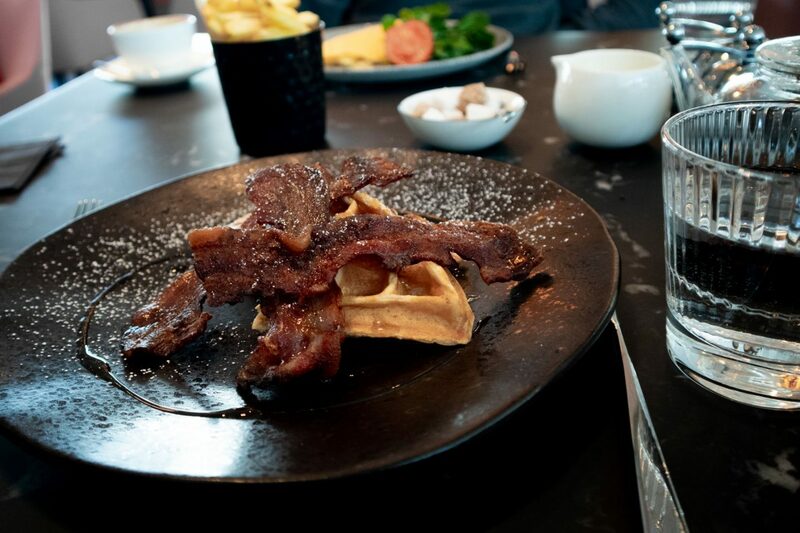 Sunday brunch? You guessed it, Victoria. 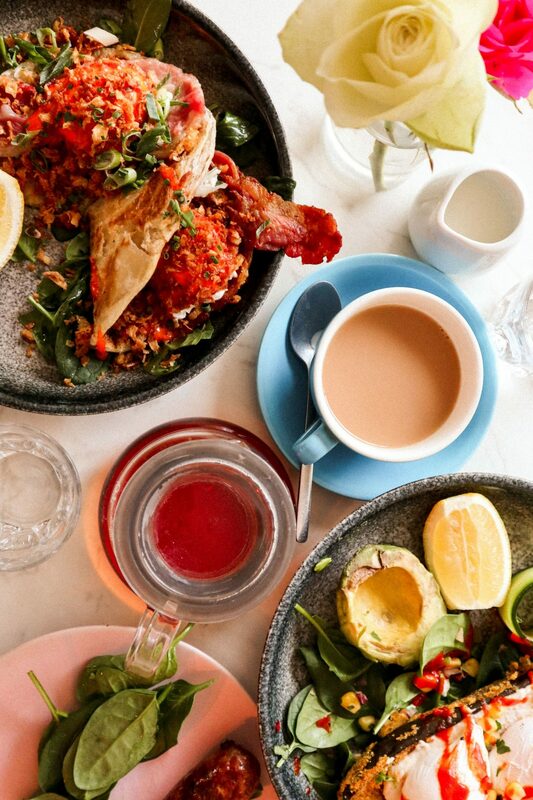 Timmy Green is a part of the Daisy Green Collection, which boasts 11 Aussie-inspired cafes and restaurants all around town. This one is clearly in Victoria, in the modern Nova development, just opposite one of the station’s exits. This time we hadn’t booked a table but were lucky enough to grab the last available one on the second floor, which was good because we were starving. The place is huge but popular, so really, it’s better to book. Shockingly, I had the aubergine fritter, I just couldn’t resist. 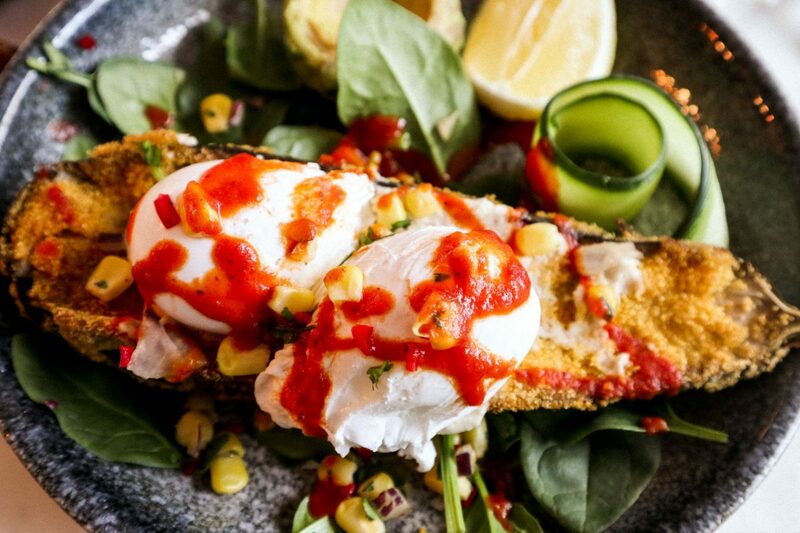 But how can you say no baked aubergine, poached eggs and avocado (see, I’m learning!)? I had to ask for a sausage on the side because I also can’t resist a sausage. It was delicious and I definitely recommend the dish. Simon had the fancy bacon roll, which came in paratha roti, with poached eggs, crispy onions and bacon (I know, what a surprise). He said it was great, and I can confirm, because if you don’t try your boyfriend’s food, what is wrong with you?! 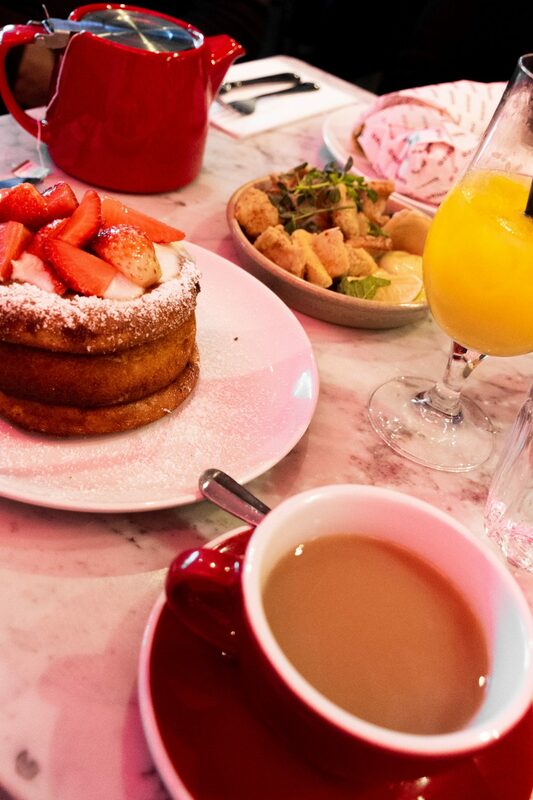 Next time we head to a Daisy Green cafe, I am planning to not be hungover and have their bottomless brunch because why the hell not?! Another SW spot, but you can find Megan’s not only in Balham. There’s one on the King’s Road, in Parson’s Green, Clapham and Balham, so you have a choice. 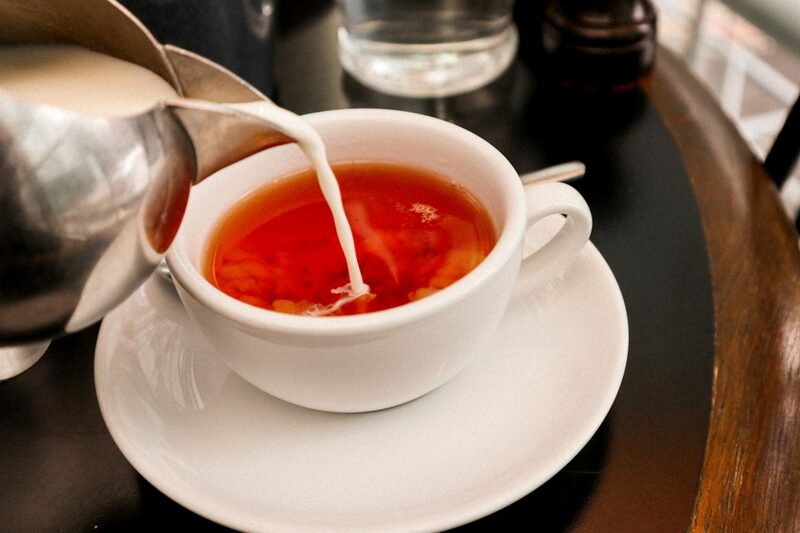 Friday is a wonderful day to visit for brunch, as it’s not too busy and you’ll get to pick your table. 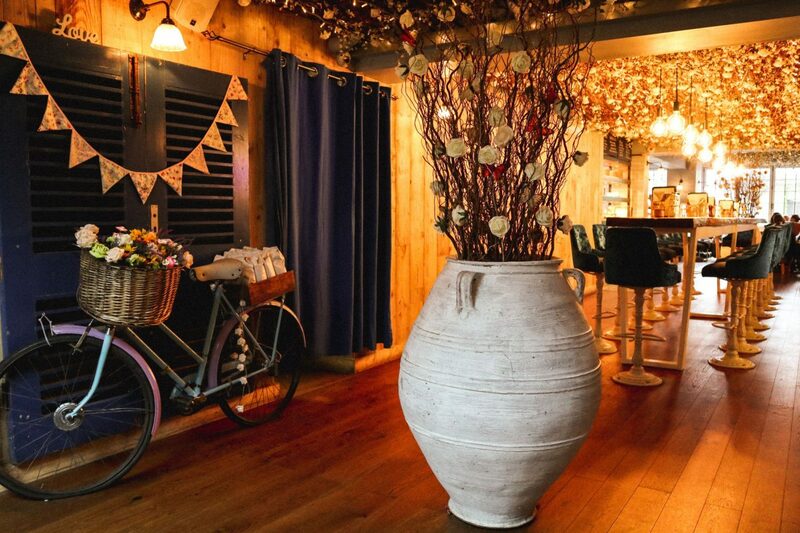 The Balham restaurant is huge, super cosy and Instagramable with its flower wall! 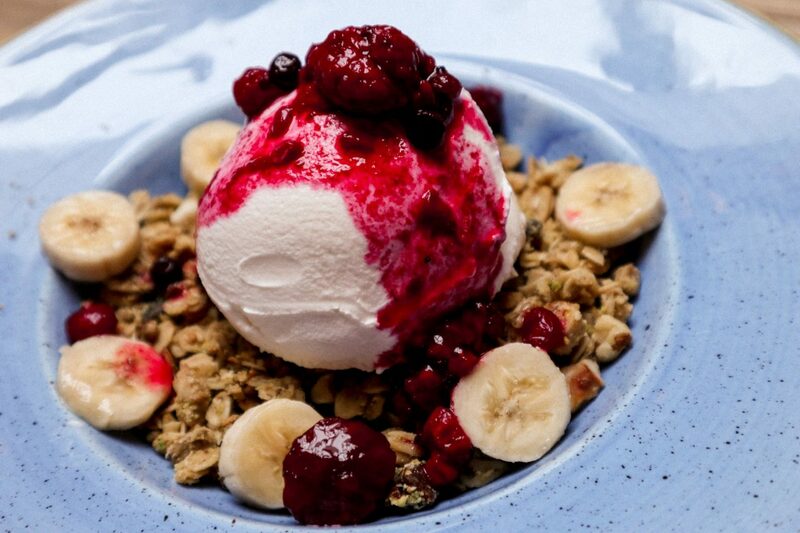 This time I went for a healthier breakfast and had the granola, which didn’t come with fruit, but they were happy to add bananas and raspberries on for me. All the other girls went for the veggie brunch with substitutes and add-ons which was also totally fine. There’s nothing worse than asking if you can swap something in your meal for something else and hearing a firm no. 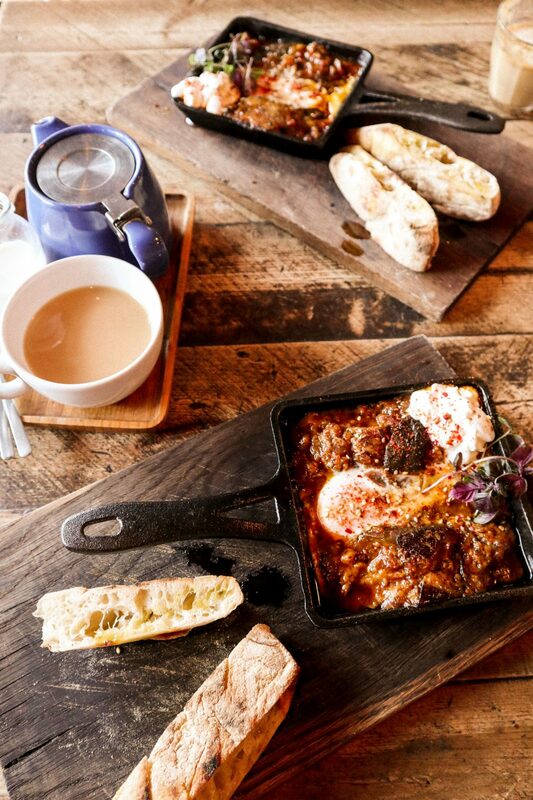 Megan’s is a fab brunch spot in London, but I would suggest making a booking on the weekend, as it might get busy. 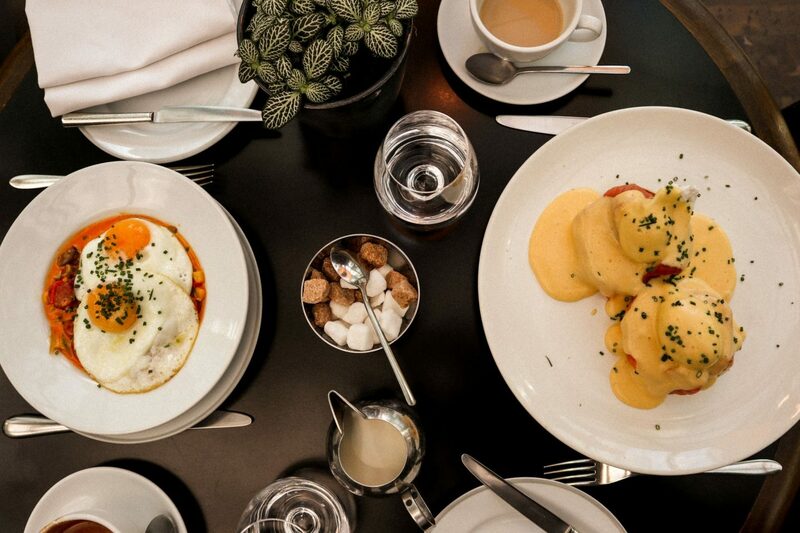 And there you have it, these are the best brunch spots I’ve found in London recently. I hope you’ve found somewhere new to try, and if you visit any of those places, please do let me know! Tag me in your Insta stories (I know you’d post some, don’t pretend like you won’t! I have picked some very instagramable places). I’d love to hear your thoughts. I’m at @kristinaivanovaa, in case you were wondering. 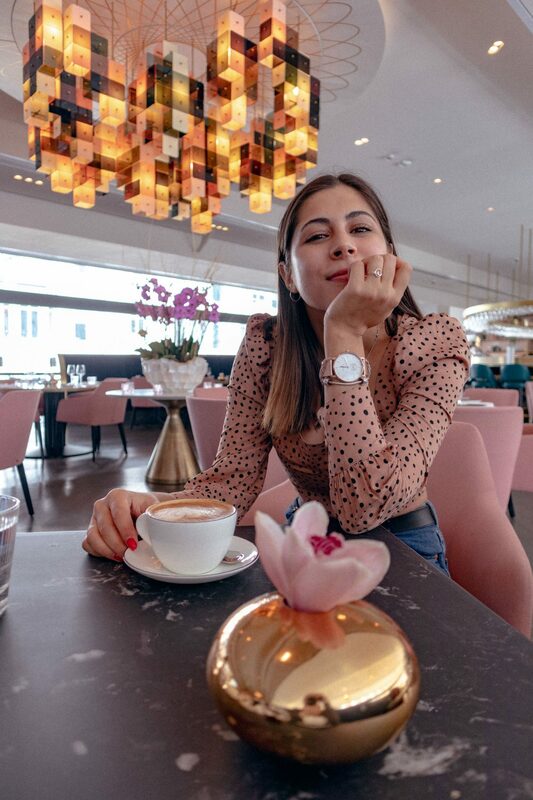 Tell me which your favourite brunch spot is, I’d love to find somewhere new!